This holiday season I am replacing bright red with burgundy. Well, at least for now. 😉 I think that any type of berry shade works beautifully for the holiday season if you don’t want to go with the typical red. I am not just talking about clothing here either. That goes for lipstick too! It really is such a refreshing alternative. This time of year is always so hectic and as much as I love the holiday season and all of the festivities that come along with it, I have not given much thought to any holiday inspired looks. Getting glammed up in pretty sparkly dresses is typically a given for any party this time of year, but truthfully we also have things to attend that aren’t that fancy. So, what do you wear while still remaining festive? I thought about this when putting together this casual look. I absolutely love white and burgundy paired together and to me, that screams Christmas! I must add in here that I scored this sweater at F21 for only $12, so of course I got it in black too. 😉 It’s actually a v-neck, so the perfect solution on a chillier day is to add some type of scarf. This will not only keep your neck warm, but it will also help to kick your outfit up a notch. 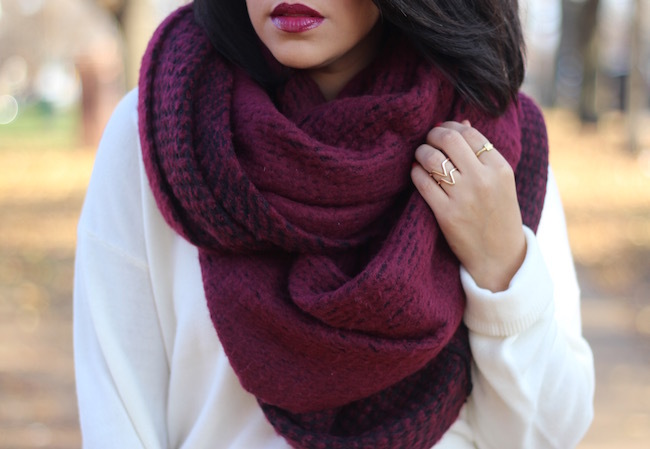 This infinity scarf is seriously everything. It’s extremely soft and cozy and I love the way it worked with this look. I decided to balance everything out by matching the scarf to my shoes and lip and then for a fun element, I used my leopard print clutch. Oh my god you look really amazing babe , the burgundy tint in the outfit seems really attractive .And the way you pulled it off in a casual way i love it ….